This historical non-fiction book is not typical reading for me. I actually picked it up after a recommendation from a Horizon Books customer I had waited on. Profoundly interesting, James Garfield’s assassination and death could have been prevented. Shortly after he became President in 1881, a crazy gunman took on the mission of killing him, and in pre-Secret Service times, achieved his goal. The story of his medical care following the event is harrowing, in that many mistakes were made, and he could have been saved. Read for yourself this “little” known chapter of our “Presidential history.” A great Father’s Day gift! The extraordinary New York Times bestselling account of James Garfield's rise from poverty to the American presidency, and the dramatic history of his assassination and legacy, from bestselling author of The River of Doubt, Candice Millard. James Abram Garfield was one of the most extraordinary men ever elected president. Born into abject poverty, he rose to become a wunderkind scholar, a Civil War hero, a renowned congressman, and a reluctant presidential candidate who took on the nation's corrupt political establishment. But four months after Garfield's inauguration in 1881, he was shot in the back by a deranged office-seeker named Charles Guiteau. Garfield survived the attack, but become the object of bitter, behind-the-scenes struggles for power—over his administration, over the nation's future, and, hauntingly, over his medical care. Meticulously researched, epic in scope, and pulsating with an intimate human focus and high-velocity narrative drive, The Destiny of the Republic brings alive a forgotten chapter of U.S. history. Candice Millard, the New York Times-bestselling author of The River of Doubt, is a former editor and contributing writer at National Geographic magazine. She lives in Kansas City with her husband and children. "Crisp, concise and revealing history. . . . A fresh narrative that plumbs some of the most dramatic days in U.S. presidential history." "Fascinating. . . . Gripping. . . . Stunning. . . . The haunting tale of how a man who never meant to seek the presidency found himself swept into the White House. . . . Millard shows the Garfield legacy to be much more important than most of her readers knew it to be." "Destiny of the Republic displays Millard's energetic writing and rare ability to effortlessly educate the listener." 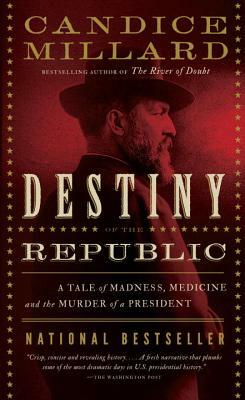 "A staggering tale. . . . Millard digs deeply into the turmoil that got James A. Garfield elected, the lunacy that got him shot and the medical malfeasance that turned a minor wound into a mortal one." "Fascinating. . . . Millard colorfully recreates the political milieu of 1880." "Millard provides a splendidly written and suspenseful account of this fascinating episode in American history." "Millard finds the ironies of history throughout this stirring narrative, one that's full of suspense even though you know what's coming. She makes you a witness, not a reader." “Make[s] for compulsive reading. Superb American history." "Splendidly insightful. . . . stands securely at the crossroads of popular and professional history."